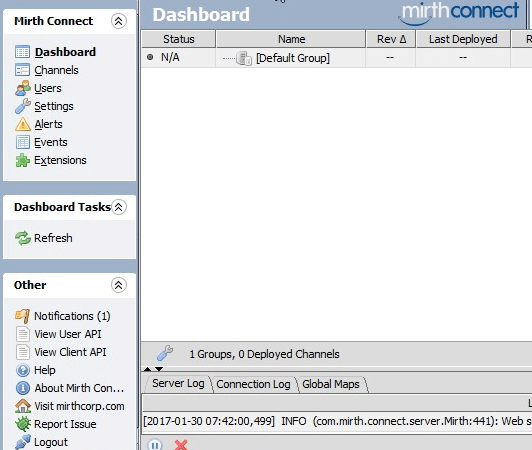 Mirth Connect is an Open Source Integration Engine that is primarily used in the Health Care domain. This support various health care standards (HL7, XML, EDI/X12, DICOM etc) that will help enterprise to integrate different systems, and let them talk to each other in a common language. MirthConnect interface engine also supports various standard protocols (for example, TCP, HTTP, JDBS, SFTP, etc.) to connect two systems. By default, when you install mirthconnect it uses Apache Derby as storage engine. But, it supports pretty much all popular databases including MySQL / MariaDB, PostgreSQL, Oracle and SQL Server. In this tutorial, we’ll explain how to install MirthConnect open source software, and configure it to talk to MySQL database on Linux platform. Recently NextGen acquired mirthconnect. The commercial version supports few additional formats such as CCD, C-CDA, ASTM. Also, the commercial version has some advanced enterprise extensions. For example: SSL Manager, Role-Based Access Control, Advanced Alerting, Channel History, LDAP Authentication, HL7 Message Generator. In this tutorial, we’ll be explain how to install the open source version of Mirth Connect on MySQL database. Make sure you have JDK 1.8 installed on your system as shown below. As mentioned earlier, by default mirthconnect comes with Apache Derby as default database. But, in this tutorial, we’ll install and configure MySQL / MariaDB database, and use that for mirthconnect. Install MySQL / MariaDB server as shown below. For this, you should install the following two mariadb packages. Note: If you are using a older version of Linux distro, where mariadb-server package is not available in the yum repository, then install the mysql-server package as shown below. Once mariadb is installed, start it and make sure it is running properly. You also may want to run the following to setup some security settings for your MySQL/MariaDB installation. This will also assign a root password for your database. Let us create a database called “thegeekstuff”, which will be used by the mirthconnect installation. For this, use the mysql command with mysql’s root username and password as shown below. Once the database is created, create a user called “thegeekstuff”, and assign a password for this. This account will be used in the mirthconnect configuration to talk to the database. At this stage, you’ll not see any mirthconnnect related tables in this database. But, once you’ve installed mirthconnect, you’ll see multiple tables here. For this tutorial, we’ll be using the tar.gz format of the mirthconnect install. First, get the download link for the tar.gz, and use wget command to it to your server as shown below. Once it is downloaded, untar it as shown below. By default, this will create the “Mirth Connect” directory under your current directory. To manage this better, move this to the /opt directory, and also remove the “space” in the name, and make it all lowercase, which is easier to manage in Linux environment. In this example, we’ll rename “Mirth Connect” to “mirthconnect”, and at the same time move it to /opt directory as shown below. The main mirthconnect properties file is mirth.properties located under /opt/mirthconnect/conf directory. http.port – 8080 is the default mirthconnect HTTP port. You can change this value to match your environment. https.port – 8443 is the default mirthconnect HTTP port. You can change this value to match your environment. database – By default this will say derby. Change this value to mysql as shown above. database.url – Since we are using MySQL database, set this database.url to the value shown above. By default this will point to the default derby database. Change this value. Make sure at the end of the url, it has the mysql database name that you created earlier. If you are copy/pasting this value from the configuration file comment lines, it will have mirthdb here. You should change this to your databasename. database.username – Set this to the mysql user that we created earlier. database.password – Set this value to the corresponding password for your mysql username. Now, start the mirthconnect as a service using mcservice command. You can also do a ps and check for the “mcservice” process that is running in the background as shown below. Note: When you start mirthconnect for the 1st time, it will connect to MySQL database, and create all the required tables. Now, if you connect to mysql, you’ll see it has created 13 new tables that are required for mirthconnect to run properly. If you are running CentOS 7 (or RedHat), then you may want to add mirthconnect to the systemd startup. Note: If you’ve installed mirthconnect as a different user other than root, then change the User and Group in the above file accordingly. After that you can use systemctl to start and stop mirthconnect as shown below. To make it start automatically when the server is rebooted, enable this systemd server for startup as shown below. 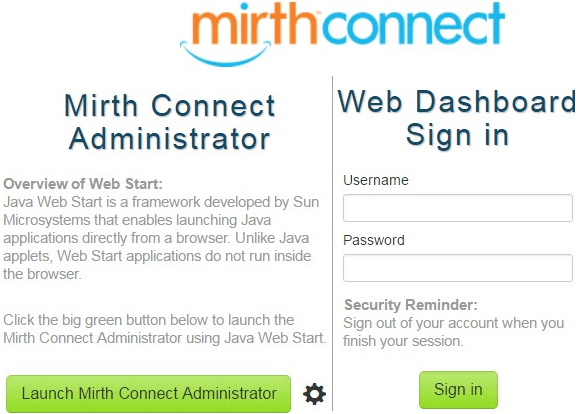 MirthConnect Administartor – This will launch the administrator UI using java webstart. Web Dashboard Sign in – If you launched the URL with http, this will display “Access Secure Site” button. Click on that to just use mirthconnect from the browser. If you use the HTTPS url, this will show the username and password textbox here. The default mirthconnect username and password is admin/admin. When you click on “Launch mirthconnect administrator” webstart button, this will download a file called “webstart.jnlp” to your system. Double click on this to launch the webstart. First time, this will launch a dialog saying “Verifying application”. This will also show which mirthconnect it is starting by showing the full URL of the mirthconnect location this is launching. Enter the username and password. When you do it for the first time, the username and password is admin. First time when you login, this will force you to change the admin password. Finally, this will display the Mirthconnect Administrator Dashboard as shown below, from here you can manage the mirthconnect by creating and managing channels. If mirthconect doesn’t start properly, check the following mirth log files for any issues. Also, for debugging purporse, you may want to temporarily disable firewalld and selinux to make sure that they are not blocking mirthconnect for some reason. After that, start the mirthconnect again and see if it starts properly. custom-lib – In this directory, as the name suggests, you can place all your custom library files. These libraries will be loaded to the mirthconnect server during startup. mcserver – If you are not using the service option, use this to start Mirth Connect in a non-service mode.